BOSCA vintage trifold key holder in black leather. Vintage Japanese makeup or coin wallet picture decoupage. Trifold wallet clutch in burgundy leather suede with rose emblem and decorative rope. Antique tapestry purse with gold tone frame and snap on clasp. Cafe de Paris large carry on wallet/clutch by Shui Mi Ma. European sports car decorated outer layer in large carry on wallet/clutch by Shui Mi Ma. 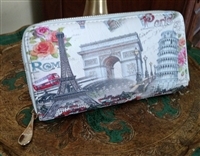 Destination Paris-Rome large carry on wallet/clutch by Shui Mi Ma. Vintage GARAY evening bag clutch in black/navy color fabric, 1950. 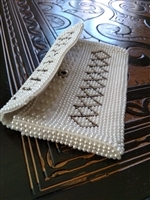 Emson vintage beaded wristlet purse, Japan. Vintage BUXTON ladies wallet, coin purse in green leather. Genuine Leather Owl wristlet wallet purse, belt eagle holder, and dog keychain. Vintage Beaded Slot machine change purse, Lucky charm. Kate Spade Italian brown leather carry on purse wallet or make up case. Original COACH multi color Bazooka IPhone 8 cover case in a box. LAURA GAYLE vintage fluorescent Beads throughout evening clutch. Original Coach Wristlet in Gold with off white stripe Pvc Signature print design with storage cotton bag. Original Coach Wristlet in Charcoal Black with Black mid stripe Pvc Signature print design with storage cotton bag. Original Coach Wristlet in Pebble Black Pvc print design with storage cotton bag. Original COACH wristlet in off white cream Pvc design with metallic silver front packet and cotton Coach storage bag. Original Coach Wristlet Brown Pvc Signature print with middle Brown stripe and storage cotton bag. Original Coach Wristlet Brown With Blue stripe Pvc Signature design with storage cotton bag. Original COACH wristlet White with Black stripe Pvc design and cotton Coach storage bag.